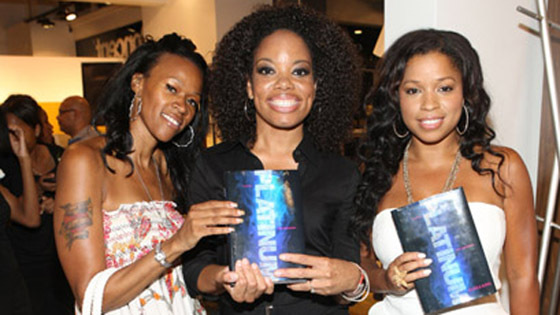 ‘Platinum’ Book Party Lights Up NYC! Last night I hit the celebration for Aliya S. King’s new novel “Platinum” at NYC’s Bo Concepts. Mrs. King also wrote “Keep The Faith,” Faith Evans’ story, which Shannon devoured and an upcoming memoir with Harlem drug kingpin Frank Lucas. Mrs. King looked wonderful and had the wives/ex-wives of DMX and Swizz Beatz in attendance, Tashera Simmons and Mashonda Tifrere, respectively (pictured above). How was the party? Lovely, but I was really excited to meet Mrs. King freckle-to-freckle (ie. face-to-face) because she’s one of the architects of the music journalism genre. So I was THRILLED to meet her. And yes, there’ll be a Q&A with Mrs. King about “Platinum” coming up here on Parlour. WOOT! Yes she is awesome! It was a great time celebrating her success!